Meet your new favorite sandwich spread, Vegan Chickpea Salad. This classic vegan staple can replace tuna salad for a simple, hearty, savory meal that is perfect for a light lunch. Chickpeas provide an excellent source of protein and fiber, and have the added benefit of not contributing to the overfishing of our oceans. Did you know that the current rate of commercial fishing will deplete our oceans as soon as 2048? Pretty scary stuff! Many people eat more fish in an effort to cut back on pork and red meat, but the best solution for health and for the environment is a plant-based diet, so try this Vegan Chickpea Salad today! In a medium bowl, mash the chickpeas until chunky. Stir in the remaining ingredients and enjoy. How easy was that? This Vegan Chickpea Salad is so moist and flavorful, it doesn’t even need any additional sauces as a sandwich. 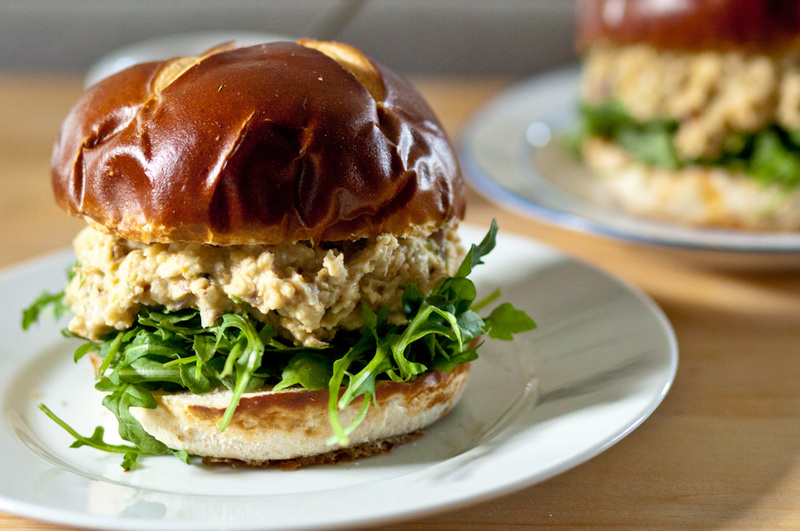 I found the most delicious vegan pretzel buns for these babies and topped them with a generous handful of arugula. The peppery bite of the greens is the perfect complement to the Vegan Chickpea Salad. I definitely recommend at least doubling the recipe, especially if you have kids. This easy dish will go quickly! If you liked this recipe, you will be sure to love our Vegan Crab Cakes and our Superfood Parsley Hummus! Yum! How many sandwiches does this recipe make?